Downtown Toronto is the most vulnerable to a severe price correction and here's why. Glance back to 1989, and the condo boom was centered in the core of the city. Downtown condos were a commodity traded by investors for a greater profit. I know a guy who bought several units in the late '80s with hopes of quick profit. But once the market crashed, he had lost all of his units plus his house - which was already paid off. Between 1989 and 1996 downtown prices have dropped by over 50% (adjusted for inflation). As nearly half of all the condo projects in the GTA are being built in the city's center, guess where the largest fall out is going to be when this condo bubble bursts? History tends to repeat itself. Another worrying sign of upcoming doom in Toronto's downtown condo market is a large presence of investors. Urbanation estimates that up to 70% of new condo buyers are investors. At the very least the number of investors is in proximity of 50%. Anyhow, the fact that 50% of downtown residents rent is an indication of a large number of investors in the area. You may say that many of the tenants live in rental buildings which would lower the investors' proportion - and that is a valid point. So I looked at the CityPlace census tract where everyone lives in condominiums. The statistics were the same, over 50% of the households rent. Below is a map of the percentage of private dwellings owned by a member of the household. In other words, the map shows the home ownership rate by a census tract. As you can see for the most part, the home ownership rate in the downtown census tracts is below 50%. 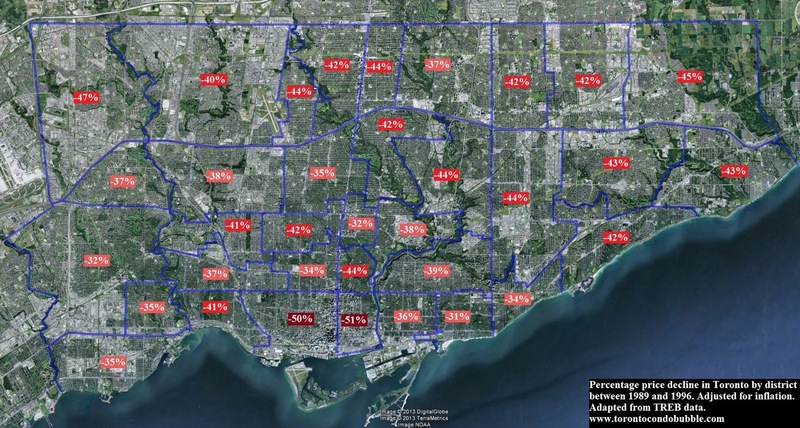 Full resolution map of home ownership rate in Toronto by census tract. Now let's take a look at the percentage of owner households spending more than 30% of their income on shelter costs. Below the heat map peaks at 30% so I looked up the actual percentage of homeowners paying over 30% of their pre-tax income on shelter costs. For example, in a census tract where CityPlace is located, a whopping 47% spend more than 30% of their pre-tax income on housing. If you replace pre-tax income with after-tax income the percentage is going to be even higher. Full resolution map of percentage of owner households in private dwellings spending 30% or more of their household total income on shelter costs. 1. Prices in downtown Toronto fell by over 50% in real terms after the first housing bubble exploded. 2. The downtown condo market is a hive of investors. 3. Housing in the downtown core is unaffordable. For instance, in neighborhoods such as CityPlace, almost half of homeowners pay more than 30% of their pre-tax income on housing needs.